Bike accident lawyers are pleased that the Wrentham Police Department recently reported that it had received a grant of $3,000.00 as part of $285,500.00 given by the National Highway Traffic Safety Administration and the Executive Office of Public Safety and Security for the improvement of bicycle and pedestrian safety. In all, 70 police departments around the Commonwealth received similar grants. The funds will be used to educate motorists and enforce existing laws designed for bicycle and pedestrian safety and hopefully avoid bike accidents and the serious injuries and wrongful deaths associated with them. In the four-year period between 2008 and 2012, Massachusetts bicyclists suffered 1,106 serious injuries and 43 fatalities in encounters with motorists. These figures do not include possibly thousands of other accidents where a bicyclist was hit by a car and was lucky to escape catastrophic injuries. A significant number of motorists dislike sharing the roadways with bicyclists who have as much right to the road as motor vehicles. Like motorcycles, bicyclists are not easy to spot and may appear to come out of nowhere to many drivers. Because bicycling is increasingly becoming a means of commuting for many workers and with the proliferation of bike lanes on city streets, motorists have to exercise more caution when driving and to expect as well as respect bicyclists on the roads. When riding your bike on the roadways, you are obligated to obey all traffic laws, including stopping at stop signs and waiting for red lights. Bike accident lawyers also note that bicyclists must yield for pedestrians at crosswalks too. You can be ticketed as any motorist may be for these traffic violations. Regardless if you are following the traffic laws and riding responsibly, motorists often do not see bicyclists on the road and enter intersections without yielding or turn into their path. Sometimes road rage, distractions, or simply not giving enough time or space when passing a bicyclist will cause a collision. 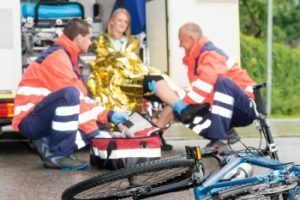 Bike accident lawyers note that because a bicyclist has so little protection, serious and incapacitating injuries as well as fatalities are usually the result. If you were hit by a car on a bike, your injuries could include traumatic brain injury, spinal cord injury, broken limbs, severe lacerations and burns from the road surface, facial fractures, neck and back sprain, and permanent disfigurement. 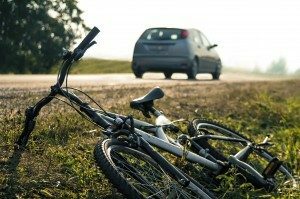 Bicycle accident injuries are often more serious than those sustained in motor vehicles since any ejection onto the roadway can result in broken limbs, head, and internal injuries. Call Burns & Jain today for a free analysis of your bicyclist injury claim.